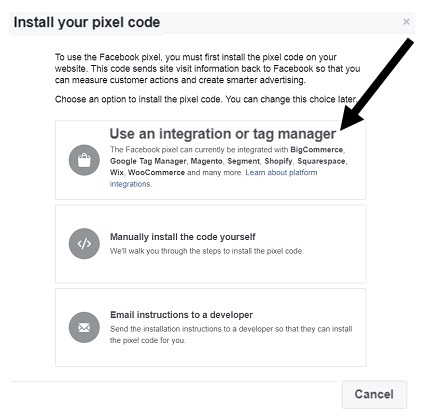 If you want to track website/Mobile App conversions (like ‘sales’, ‘leads’, ‘signups’, ‘add to cart’ etc) generated by Facebook users on your website in your Facebook advertising account then you need to deploy the ‘Facebook pixel code’ on all of your website pages. 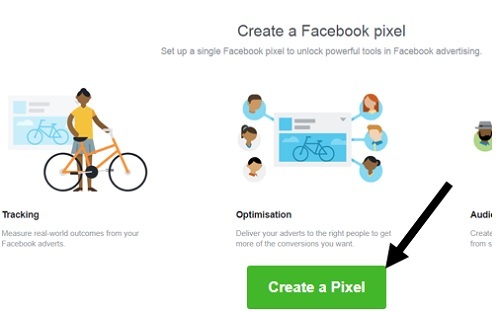 Another advantage of deploying the ‘Facebook pixel code’ on your website is, you can then create ‘custom audiences’ in your Facebook Advertising account. Through custom audiences you can remarket your website users on Facebook. 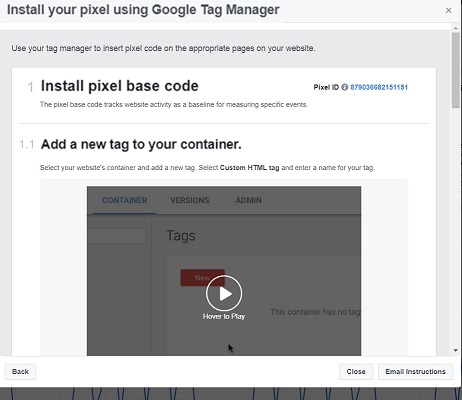 In this article, I will show you, how to test and deploy the Facebook pixel code and Facebook event code on your website via Google Tag Manager. #1 Track and report on your website users activities like: Pageviews, view content (viewing product detail pages), website searches, signups, leads, ‘add to cart’, ‘purchases’ etc. #2 Retarget your website users on Facebook. #3 Find new target audience / customers for your business. #4 Track and report on the conversions generated by your Facebook ads. #5 Automatically optimize your ads for conversions. 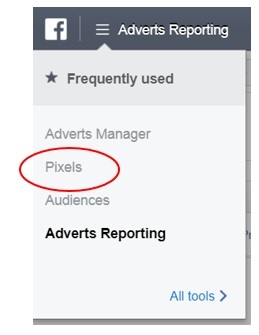 Through pixel id, Facebook is able to differentiate between various Facebook advertisers. The Facebook machine learning algorithm uses this pixel code to learn about your website users on Facebook. For example what Fan pages they like, click, comment, people they engage with etc on day to day basis. The more the pixel code fires on your website, the more Facebook learn about your website users and better it becomes in targeting them and other similar audiences to complete your website conversions. What that means, if you have got a brand new Pixel code, Facebook will know little to nothing about your website users’ activities on Facebook. Consequently, your Facebook ads, may initially struggle to generates sales/leads for your website and you are likely to see negative ROI. Businesses who are making a killing on Facebook, generating millions of dollars in sales via Facebook ads, all have got very matured Facebook pixel. So their pixels know a lot more about their target audience/customers than your brand new pixel. The Facebook pixel code track your website users’ activities on Facebook. Facebook call these users activities as ‘events‘. Each user activity is defined via a unique Facebook event. Each Facebook event has got one or more attributes. For example, the Facebook ‘purchase’ event has got two attributes: ‘value’ (which is the value of the purchase) and ‘currency’ (the currency in which the purchase was made). Similarly, the Facebook ‘AddToCart’ event has got two attributes: ‘value’ and ‘currency’. Custom Facebook Events are the one which are defined by people like me and you. So if there is any users’ activity which you can not track via standard Facebook events then use the custom Facebook events for that. The Facebook default pixel code (also called ‘pixel base code‘) refer to the pixel code supplied by Facebook. This code does not contain any customization from the end user (like you or your developer). This code also do not contain any standard or custom Facebook event code. #1 Hard code the pixel code on all the pages of your website. 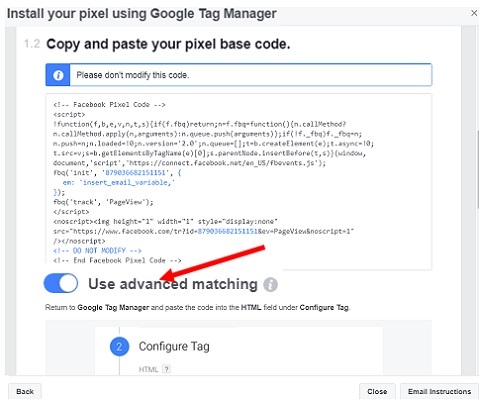 #2 Use Google Tag Manager to deploy the default pixel code on your website. #3 Enter the Facebook Pixel id. Many Shopping carts like ‘Shopify’ can automatically add Facebook default pixel code on your website. All you need to do is, to supply your Facebook pixel id to your shopping cart software. #1 Hard code the event code on your website. 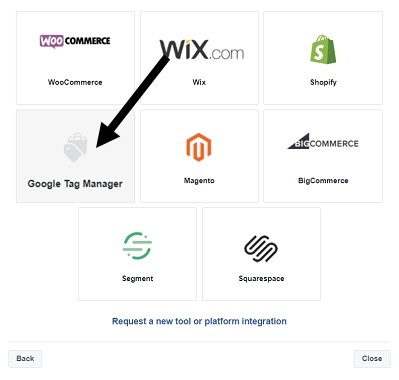 #2 Use Google Tag Manager to deploy the event code on your website. #3 Enter the Facebook Pixel id. Many Shopping carts like ‘Shopify’ can track all standard Facebook events automatically. All you need to do is, to supply your Facebook pixel id to your shopping cart software. Note the word ‘similar’. This is not going to be your actual code. The actual code is likely to contain server side variables which pull data from your shopping cart. 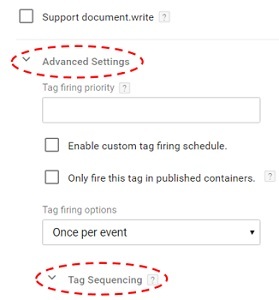 In case of Google Tag Manager, the actual code is likely to contain data layer variables which pull data from the data layer embedded on your ‘order confirmation’ page. You can however send this example code to your developer and tell him to collect the data in this format. He should understand, what to do next. Step-1: Signup for Facebook Business Manager account (if you already don’t have one). 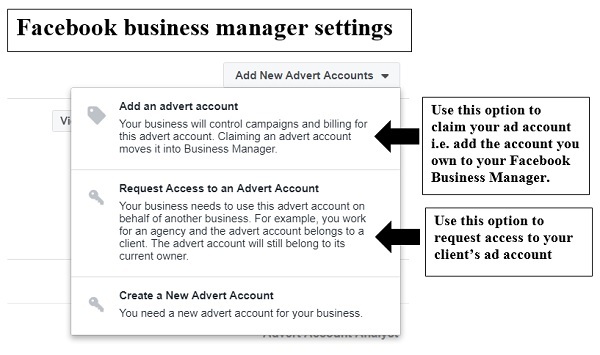 Through business manager account you can manage multiple advertising accounts. Note: You would need a personal Facebook account before you can signup for Business Manager account. Note(2): Each Advert account represents one website. 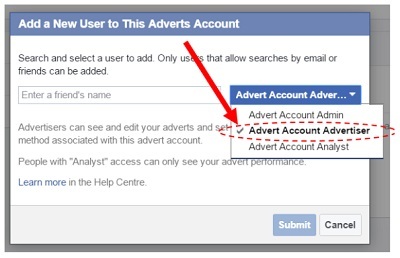 So if you have got two websites for Facebook advertising then create/use two adverts accounts. Note(3): Each advert account has got it own unique pixel code. The pixel id makes a Facebook default pixel code unique. Note(1): The ‘Advanced Matching’ feature helps in improving the effectiveness of your Facebook conversion reporting and Facebook ads optimization and targeting. 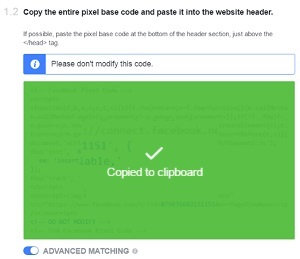 Here the highlighted code in bold text is the additional code added to the Facebook default pixel code. 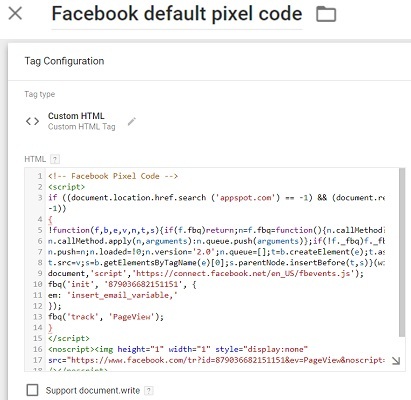 Without this code, Google Tag Manager, most likely, going to inflate your Facebook pixel data. For example reporting more ‘add to carts’ or ‘purchases’ than the one actually occured on your website. This URL is going to appear as ‘Referring URL’ in your Facebook Pixel reports. So what I have done here, is not to fire the Facebook default pixel code, if the current and referring URL contains ‘appspot’. We are going to use this modified Facebook pixel code in GTM. Step-12: Login to your Google Tag Manager account and create a new custom HTML tag. Step-16: Save your new tag and then preview it to see whether it fires on all of your web pages. 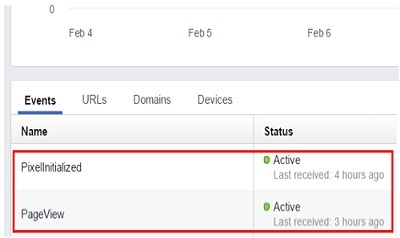 Let us suppose you want to track ‘add to carts’ on your website within Facebook so that you can see which Facebook ads are resulting in ‘add to cart’ activity on your website. 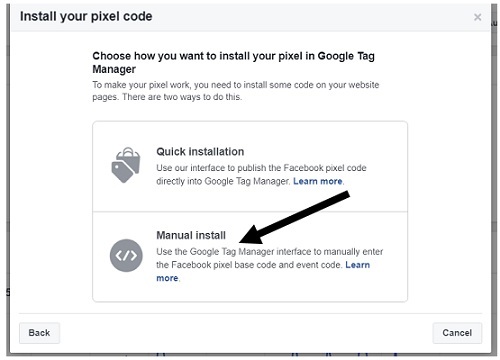 Step-2: Click on ‘Use an integration or tag manager’ option then select ‘Google Tag Manager’ and then Click on ‘Manual Install’. Here the highlighted code in bold text is the additional code added to the Facebook ‘add to cart’ event code. We are going to use this modified event code in GTM. 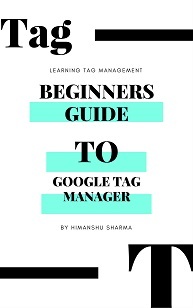 Step-5: Login to your Google Tag Manager account and create a new custom HTML tag. Note: You would need to create a separate custom HTML tag for each unique Facebook event. 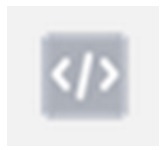 Here ‘Facebook default pixel code’ is the tag I created to fire Facebook pixel code via GTM. 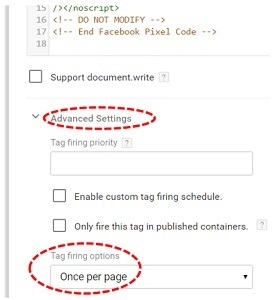 Step-9: Select the checkbox ‘Don’t fire Send Add to Cart Event to Facebook if Facebook default pixel code fails’. Step-10: Fire this tag only on those web pages which contain ‘Add to Cart’ button and when the button is clicked. Step-11: Test whether this tag fire correctly. If it does then publish the container. Step-12: Repeat Step 1 to 11 for other Facebook events. Step-1: Install the Facebook Pixel Helper chrome extension and enable it. This add-on is used to validate various Facebook pixel events. Once this add-on is enabled, it will appear as a button at the top right hand side of your chrome browser window. 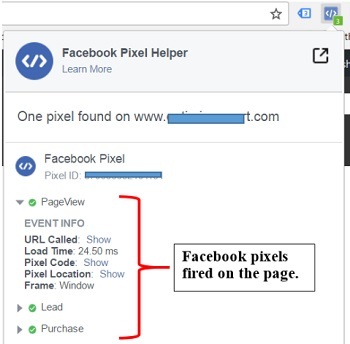 The green check mark next to each Facebook event (‘PageView’, ‘Lead’, ‘Purchase’ etc) shows that the Facebook pixel for that particular event is firing correctly. 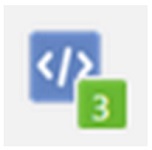 Since there is a green check mark next to the Facebook ‘PageView’ event, it means the event is firing correctly. 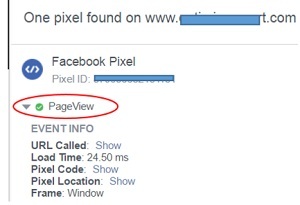 Note: The ‘Facebook default pixel code’ which we just deployed via GTM on the website fire only the Facebook ‘PageView’ event. It does not fire any other Facebook event like ‘view content’, ‘add to cart’, ‘lead’, ‘purchase’ etc. 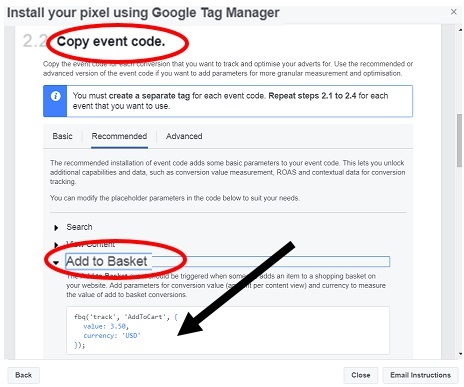 For that, you will also need to deploy the Facebook event code on your website via GTM. The ‘Active’ status 100% confirm that the Facebook default pixel is firing correctly.